Trailhead is on East Washington Road in Bradford, NH. From the junction of Rt. 149 and Henniker Street in Hillsborough, take School Street north. In 0.4 miles, School Street becomes Center Road. Continue 2.7 miles and bear left onto East Washington Road. Drive 4.2 miles and bear right to stay on East Washington Road. Go 1.5 miles and turn right to stay on East Washington Road. In less than 0.1 miles, take a right onto Bradford Springs Road. When the road crosses the town line, it becomes East Washington Road (different than the one you were on before). Shortly after the town line, you will see the kiosk on the right. 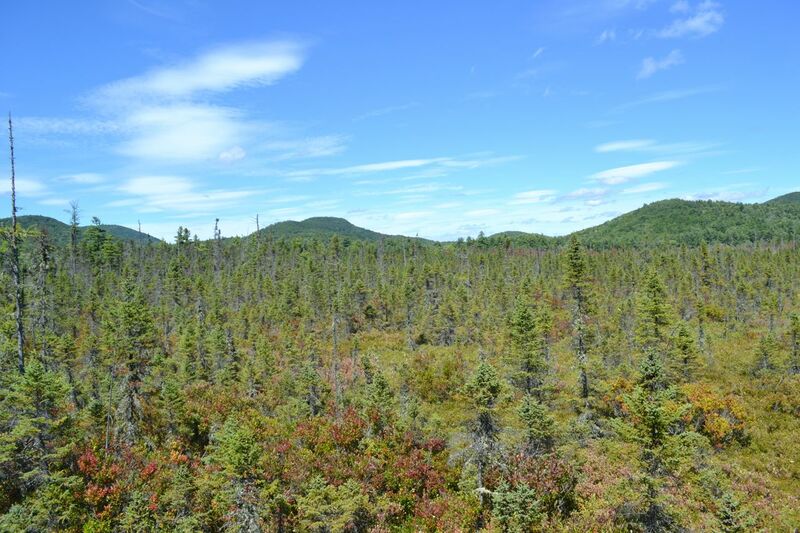 Bradford Bog's boardwalk takes you on a tour of two unique communities: an Atlantic White Cedar Swamp and a medium-level fen system. Pick up a guide at the kiosk to learn about the plants in the bog as you walk. The boardwalk takes a straight course through the swamp, the longest part of the walk. Inside the mostly-dry swamp, you will find many special plant species, pointed out by signs. At the end of the dark swamp, it turns to enter the bog. The environment very rapidly changes as you step into what is known as a medium-level fen system. The boardwalk winds through the bushes and out to a viewing tower (about 1/4 mile from the parking area). From the tower, you can see out over the open bog.